And here we are, sitting in our tents again - only this time the tents are physically tied into the mountain as we are precariously perched on a snowy and rocky ridge. Our members are under strict orders to clip into the ropes the moment they step out of their tents, and as usual they are being awesome and taking care of themselves in these difficult living conditions. So much of being successful on these trips is just simply having the will to stay up and melt snow and force yourself to hydrate, even after a long day. Today was certainly a long day - we left Camp One at 07:30 and followed the fixed lines up the mountain ridge. The team paced themselves excellently, and we made great time to the base of the Yellow Tower just below Camp Two. Many teams have been making use of this good weather, which means we encountered a lot of climbers trying to descend the same lines we were climbing. Unfortunately, that had us waiting our turn for some time, but fortunately the weather was absolutely stunning. Very little wind and sunshine had us warm while we waited, and gave us the chance to take lots of photos of the Himalayan giants that surrounded us. Once we had our turn to climb the Yellow Tower, our climbers had to put both their ascenders on the rope to gain upward progress on the 25m vertical rock face. Climbing a rope in this style at sea level is challenging, but doing it at 6050m is taking it to another level. Once again, I'm psyched to report the team performed strongly. Our phenomenal Sherpa team did a great job helping us get settled in. 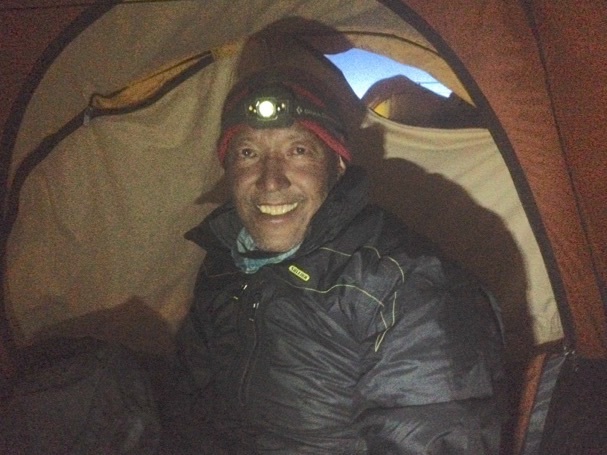 Tim and I have the pleasure of sharing a tent with our lead climbing Sherpa tonight, Lakpa Dorje. It's really great working alongside locals who know these mountains so well, and individuals who Adventure Consultants has had a long standing relationship with. Lakpa told me I was strong like Sherpa, but until my muscles start producing oxygen like theirs do, I'll respectfully beg to differ. Tomorrow the plan is to move to Camp 2.9, and it looks like we have another great weather day ahead of us. Wish us well!